BOISE, Idaho — Jim Donald has been named president and chief executive officer of Albertsons Cos. effective immediately. He had been president and chief operating officer. Robert Miller, currently the company’s chairman and CEO, will continue as chairman . 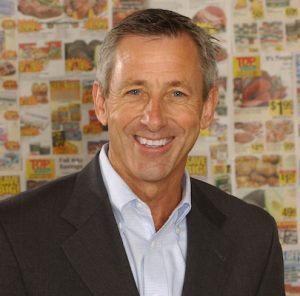 Donald’s 47-year retail career began as a trainee in Florida with Publix Super Markets Inc. He joined Albertsons in 1976, which culminated in his being appointed vice president of operations in Arizona. In 1991, he was recruited personally by Sam Walton to join Walmart to lead the development of its grocery business and Superstore concept. Donald subsequently left for Safeway in 1994 to be the senior vice president of its 130-store Eastern region, a position he held for two years. His first CEO role was at Pathmark Stores from 1996 through 2002, followed by his most well-known appointment — as president and CEO at Starbucks — where he notably led the company through record growth, including five straight years of 20%+ annual earnings increases. Post Starbucks, Donald served as CEO of two other companies, Haggen and Extended Stay America Inc. Named one of the “Top 25 CEOs in the World” by The Best Practice Institute and one of Business Travel News’ “25 Most Influential Business Travel Executives” in 2013 for his leadership of Extended Stay America where he led its successful $565 million IPO, Donald joined Albertsons in March as president and COO. Miller’s 57-year retail career began as a high school job in Southern California in the backroom of a neighborhood supermarket. He took on roles of increasing responsibility, culminating in his serving as executive vice president of operations for Albertsons Inc. He left Albertsons in 1991 and went on to serve as CEO of Fred Meyer Inc.; COO and vice chairman of Kroger Co.; and CEO of Rite Aid Corp. In 2006, Miller returned to lead Albertsons LLC as CEO following the divestiture of Albertson’s Inc.’s assets.